Morningstar team will set up shop in Anaheim, CA, at the premiere solar and storage event in North America: Solar Power International, Sept 25-27. Stop by Booth 1924 to join us for a celebration of our 25 years of leadership in solar charging technology. Over the years people have tried to discover the secret of how Morningstar is able to produce such reliable solar charge controllers. “What’s your secret sauce?” they’ve asked. But the secret isn’t in the sauce, it’s in the software. Click here to read more about what one of our distributors learned after interviewing Morningstar’s Director of Engineering about this phenomenon. The new Relay Driver Overview and Applications page provides the latest details about how to setup and use the Morningstar Relay Driver to control mechanical or solid-state relays in AC and DC power systems. Morningstar’s RelayDriver™ is a logic module which provides high level system control functions such as high/low voltage alarms, load control and generator start. Did you know that the new ProStar Gen3 solar charge controller is equipped with DIP Switches (switch #’s 4, 5 and 6) that enable seven preset charge configurations and a custom setting to best meet the charging requirements for valve regulated AGM lead acid batteries? Higher Voltage Equalization charging, commonly used with Flooded batteries, can be harmful to valve regulated AGM batteries. To avoid this problem, auto-equalize options can be disabled for the ProStar Gen3 solar charge controller by switching DIP Switch #7 to the OFF position, regardless of your other DIP Switch settings. The 15 amp and 30 amp Prostar Gen3 models are the newest and smallest Morningstar controllers to include the seven preset and custom charging configurations, and the option to disable auto-equalization. Other larger Morningstar controllers which include similar preset configuration options are the Prostar MPPT, TriStar, and TriStar MPPT controllers. 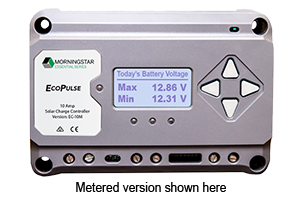 Morningstar’s TriStar MPPT™ 600V Solar Charge Controllers have proven to be a highly reliable solution to enable several application scenarios including: The use of smaller diameter wire to reduce costs and simplify installation. Long wire runs from the array to the controller. New and retrofit grid-tie systems with battery backup. Each of our 600V charge controller SKU’s are pictured and described below so you can make sure you use the version that is most appropriate to meet your needs. TS-MPPT-60-600V-48 Standard version: smallest version that does not have a PV disconnect or transfer switch. This version is most often used in high voltage off-grid residential and telecommunications applications with long wire runs from the array to the controller. TS-MPPT-60-600V-48-DB DB version: includes a disconnect box to disconnect power from the PV array and connection to batteries. This version is most often used in off-grid residential and telecommunications applications by those who don’t want to be tasked with installing their own disconnect solution to meet safety requirements. TS-MPPT-60-600V-48-DB-TR TR version: includes a transfer switch which directs PV array power to a grid tied string inverter or to a battery bank. This version is used to retrofit grid-tied systems with battery backup for critical loads. TS-MPPT-60-600V-48-DB-TR-GFPD TR with GFPD version: includes a transfer switch and a pre-wired connection to a ground fault protection device. This version is used to retrofit grid-tied systems with battery backup and it meets US NEC requirements for ground fault protection. Morningstar’s new Ethernet MeterBus Converter (EMC-1) enables IP-based network and internet connectivity to compatible Morningstar products for remote monitoring and configuration of system settings. Here are the top 5 advantages of the EMC-1 versus other serial converters on the market: 1. Wide operating temperature range from -40°C to +60°C and conformal coating designed for the harshest off-grid environments. 2. Wide operating voltage range allowing a single product to be compatible with 12, 24, and 48 volt battery systems. 3. Auto-detection and configuration when connected to compatible Morningstar products. 4. Low power consumption (2W maximum). 5. Simple connectivity via an RJ-11 port.